How Good is Your SPIEL? Take a look at the SPIEL outline below. How do you measure up against our SPIEL ratings? Exactly who do you want as clients? There are only 10 whales for every 100 dolphins. Market to one segment of affluent suspects at a time. Not one-size-fits-all. In the main, the people you are targeting will be currently invisible to you. Profiling your ideal clients so they as similar as possible will help you understand their particular high end requirements. It is this knowledge that presents an opportunity to dominate that market. When was the last time you responded to the first contact made by a company you hadn’t previously heard from? Communicate personally in sequenced campaigns. Your mindset must be to allow your prospects to make the next natural step towards you. We’ll help create motivators to do this. The task here is compel suspects to become visible to you. To raise their hands. Then you patiently educate them to become clients. Free this, huge discount on that, is imprisoned thinking. Protect your price integrity and focus on what your market really wants. Use an irresistible information offer. A report, your book, or an online limited access how-to video. Information-first marketing enables you to ‘show up alone’ and paves the way to better, more valuable clients. Conversion of prospects to clients will be higher, possibly from fewer leads at a higher cost. Create raving fans by going beyond what people expect. Visualise the pinnacle daily level of customer service you can offer your affluent clients. What does that look like? What improvements can be made? Ask your ideal clients what they would really love if they thought it was possible. Then, consistently deliver what your clients want plus a little bit more that is unexpected. Do follow-up calls and send shock and awe packages. This is where you have the most to gain. It’s more than just keeping your affluent clients for a long period. You can really define who your 80:20 ‘whale’ clients are, and what they want, then price higher and offer premium versions. Ascension is the best retention strategy. Staying in touch is critical, most clients leave you because they feel ignored. Do this with printed newsletters and campaigns to prompt referrals from your active customer base. Complete the form and we’ll reply with your score and some next step recommendations. There is no obligation. 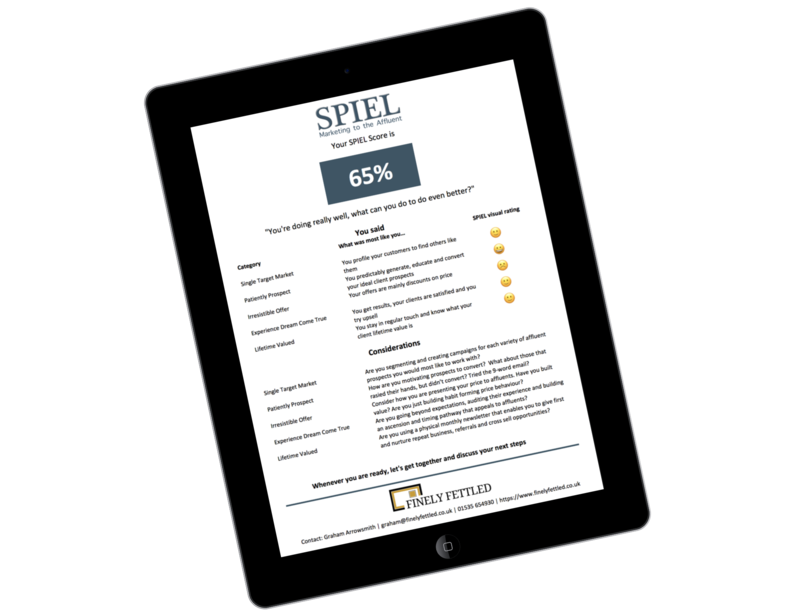 Whenever you are ready to have a conversation about your marketing strategy, your SPIEL score will help you focus on what you are doing well now as well as what you can do better. We receive an email of your selections. Then we produce a report just like this. We’ll email your results in the form of a pdf as soon as we can. Have a good look at the considerations, as they are designed as a conversation starter. If you are ready for that, just complete the form below.